Got a heavy-duty variant of the Chevy Silverado or GMC Sierra? If so, you made the right choice, as both trucks are strong and reliable, sport high-strength steel frames, and have a towing capacity of 23,300 pounds (depending on the model and engine). Are their stock bumpers durable enough for heavy-duty work, though? Most likely not. Replacing your stock bumpers with good heavy-duty aftermarket steel bumpers maximizes your truck’s utility and extends its life as much as possible. Durability: OEM bumpers tend to be pretty thin, at least compared to aftermarket steel bumpers. While a tap in the parking lot might not affect them, striking a tree or fence post can dent them up pretty good. An animal strike or low speed collision can destroy them, however, and that's probably not what you want from a work or off-road vehicle. Better Impact Absorption: Bumpers are supposed to protect your truck's body from damage, as well as absorb impacts. A steel aftermarket bumper can absorb a much greater impact than an OEM bumper, all things being equal. 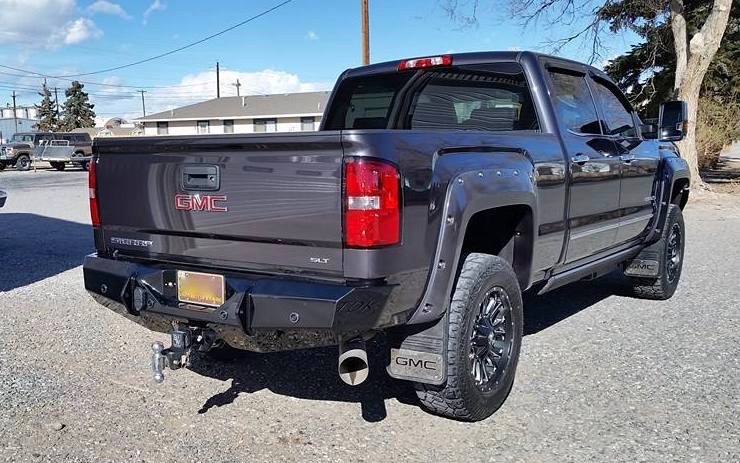 Affordability in the Long Run: Since a steel bumper protects the body of your truck better than an OEM bumper does, your risk of facing expensive body repairs reduces once you outfit your truck with heavy duty aftermarket steel bumpers. Weight: Steel bumpers weigh a bit more than OEM bumpers, so installing one on your HD truck may affect your truck's ride quality. This is less of a concern on an HD truck, but still. If you add a couple hundred pounds of steel to the very front of your truck, your ride is going to change (at least a little). Upfront Cost: Unfortunately, good quality steel bumpers aren't cheap. While the upgraded durability can save money in the long run (a single animal strike can cover the cost of buying one), it would be foolish to talk about adding a new bumper to your truck without mentioning the upfront cost. Still, these concerns aren't huge. If the weight of the steel bumper impacts your truck's ride, a set of air bags up front can fix it, as can a set of upgraded front springs. As for the cost, the price of an aftermarket steel bumper is close to the same price as an OEM replacement. You might be able to sell your existing OEM bumpers on Craigslist (or to a local body shop) for a pretty good price, making the cost of a new steel bumper a bit easier to tolerate. Only buy USA-built steel bumpers: The steel quality standards in the United States are far stricter than those in many other countries, so you'd be getting more bang for your buck with a USA-built steel bumper. 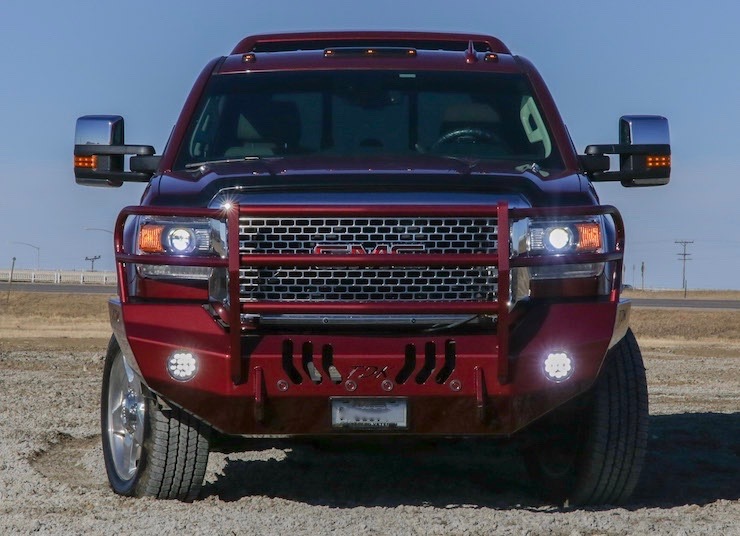 Don’t settle for anything less than a steel bumper that meets all of your needs: With so many steel bumper choices on the market, there’s no reason to settle on a bumper that’s lacking a few features your truck needs. To avoid this problem, consider having one customized to include everything you’re looking for. Pay close attention to the welding: Unfortunately, not all steel bumpers are created equal. Some aftermarket steel bumper manufacturers try to get away with selling bumpers with low-quality welds. You want a steel bumper that’s hand-welded by certified welders, like TDK's. Get a great warranty: A good manufacturer will provide a great warranty on their products. A lifetime warranty should be expected. 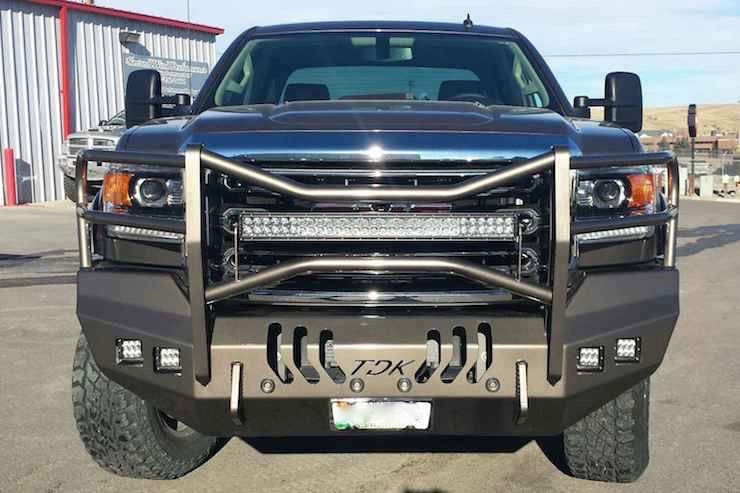 If you do a lot of heavy-duty driving, a bumper grille guard is what you need. While these bumpers are mostly built for off-road vehicles, heavy-duty trucks can benefit from them just as much. With a bumper grille guard, the entire front of your Silverado/Sierra HD truck, including the headlights and the grille, is protected from rocks, debris, and hard impacts. Another cool thing about bumper grille guards is that you can order it in different styles. Our Mayhem style (pictured above) is pretty popular. Many people focus on the front bumper so much that they neglect the rear bumper. It’s just as important as the front bumper, especially for heavy-duty trucks. Get a steel rear bumper, and your HD truck will have just as much protection in the back as it does in the front.